Begin by holding the crucifix, saying "In the Name of the Father and of the Son and of the Holy Spirit," (making the sign of the Cross while doing that), then say the Apostles Creed. On the single bead just above the cross, pray the "Our Father." 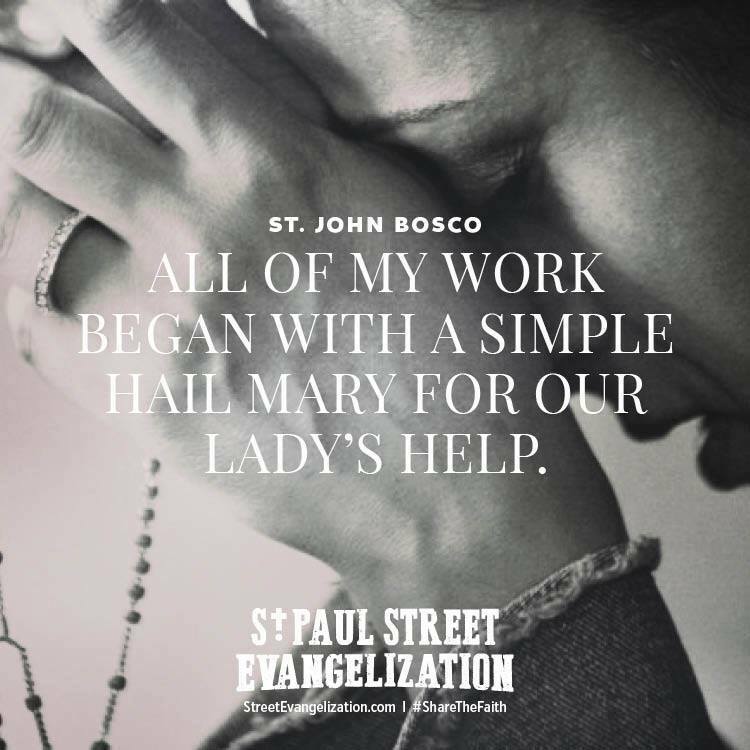 This and all prayers of the rosary are meditative prayers. The next cluster has 3 beads. The "Hail Mary" prayer is said on these three beads. 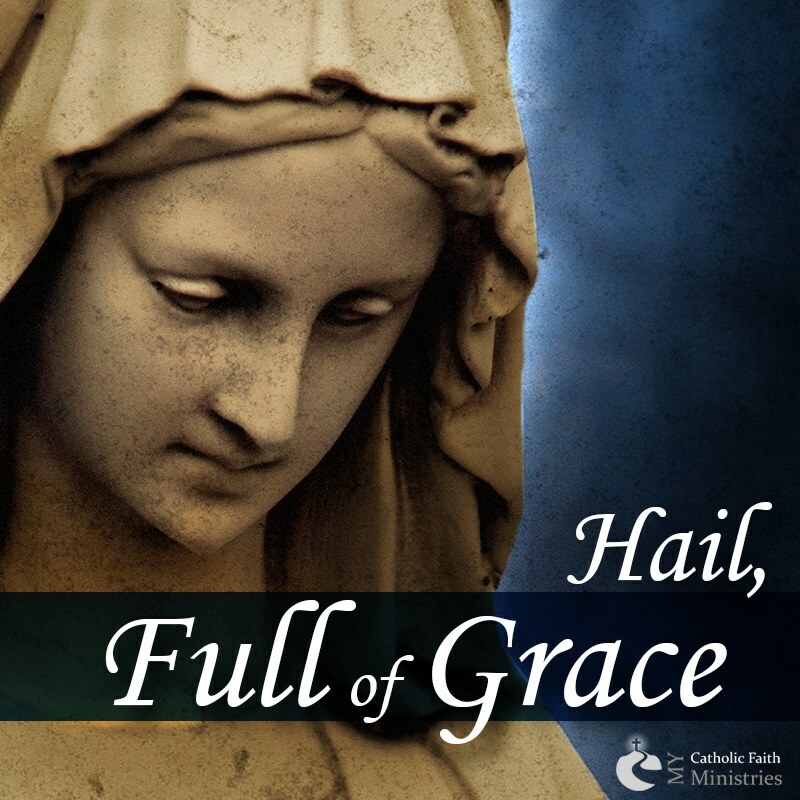 You pray the 3 Hail Marys while meditating on the three divine virtues of faith, hope, and love/charity. On the chain or cord after the three beads, say the "Glory be..."
On the next bead, which is a single bead, you announce the first divine mystery of contemplation. For example, if it were a Monday, you would say the first Joyful Mystery is "The Annunciation", at this point you pray the "Our Father" prayer. Now this will bring you to the first decade, or set of 10 beads of the Rosary. You will then pray 10 Hail Marys while contemplating the first mystery, example: The Annunciation. You will now come to the second decade or group of 10 beads, you will now pray the 10 Hail Marys while contemplating the appropriate mystery. I believe in God, the Father Almighty, Creator of heaven and earth and in Jesus Christ, His only Son, our Lord; Who was conceived by the Holy Spirit, born of the Virgin Mary, suffered under Pontius Pilate, was crucified, died, and was buried, He descended into hell; the third day He arose again from the dead; He ascended into Heaven, sitteth at the right hand of God, the Father Almighty, from thence He shall come to judge the living and the dead. I believe in the Holy Spirit, the Holy Catholic Church, the communion of saints, the forgiveness of sins, the resurrection of the body, and life everlasting. Amen. O God, by the life, death and resurrection of Your only begotten Son, You purchased for us the rewards of eternal life; grant, we beseech You that while meditation on these mysteries of the Holy rosary, we may imitate what they contain and obtain what they promise. Through the same Christ our Lord. Amen. Most Holy Trinity - Father, Son, and Holy Spirit - I adore thee profoundly. I offer Thee the most precious Body, Blood, Soul and Divinity of Jesus Christ, present in all the tabernacles of the world, in reparation for the outrages, sacrileges and indifference's whereby He is offended. And through the infinite merits of His Most Sacred Heart and the Immaculate Heart of Mary, I beg of Thee the conversion of poor sinners. Mary, Queen of the Holy Rosary, pray for us. Mary, Queen of Peace, pray for us. Mary, Our Loving Mother, pray for us. 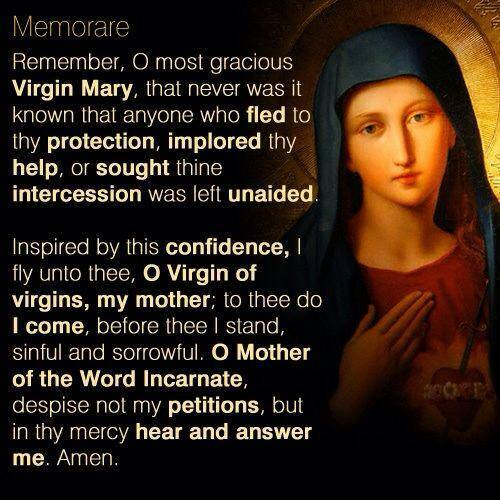 Remember, O most gracious Virgin Mary that never was it known that anyone who fled to Your protection, implored Your help, or sought Your intercession was left unaided. Inspired with this confidence, we fly to you, O Virgin of virgins, our Mother. To You we come; before You we stand, sinful and sorrowful. O Mother of the Word Incarnate, despise not our petitions, but in Your mercy, hear and answer us. Amen. The soul which recommend itself to me by the recitation of the rosary, shall not perish. Whoever shall recite the rosary devoutly, applying himself to the consideration of its sacred mysteries shall never be conquered by misfortune. God will not chastise him in His justice, he shall not by an unprovided death; if he be just he shall remain in the grace of God, and become worthy of eternal life. St. Francis de Sales said the greatest method of praying IS- Pray the Rosary. St. Thomas Aquinas preached 40 straight days in Rome Italy on just the Hail Mary. St. John Vianney, patron of priest, was seldom seen without a rosary in his hand.